Everybody loves guacamole. You can never go wrong serving up a big bowl along with a heap of chips or crackers, but I was looking for something a little different. I wanted the same wonderful creaminess of guacamole, but with a twist. 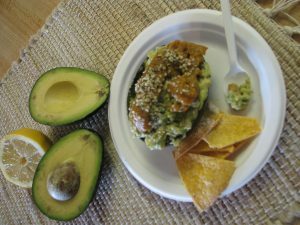 These deviled avocados with spicy curry sauce hit the spot! Apples, raisins, and onions with a tablespoon or two of hemp seeds and topped with a spicy curry sauce left Wholistic Kitchens Clubbers talking. Of course, you don’t have to serve them up in the avocado shells. They are yummy any which way you choose. This recipe is from kblog.lunchboxbunch.com. Rinse your avocados well under cold water. Dry. Slice avocados into halves, remove pits. Scoop avocado flesh. Add to small bowl and drench leftover avocado bowls in lemon juice. until a thick avocado salad forms. Set aside. Whip together curry sauce. Place in the fridge a few minutes to firm up a bit for best drizzling. Add avocado crunch salad to scooped avocado shells. Pile it high. Drizzle curry sauce over top. Add hemp seeds over top and some more fine black pepper. Serve! Note: These actually store in the fridge pretty well for up to a day. Just cover well and drench outside of stuffed avocados in lemon juice to prevent browning.